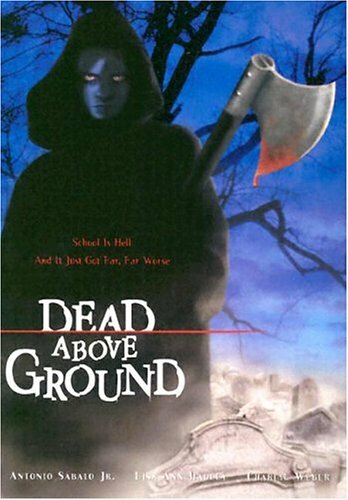 Director: Chuck Bowman / Writer: Stephen J. Cannell / Cast: Antonio Sabato Jr., Lisa Ann Hadley, Charlie Weber, Josh Hammond, Adria Dawn, Lauren German, Stephen J. Cannell, Corbin Bernsen, Keri Lynn Pratt, Adam Frost, Tony Denman, Reagan Gomez-Preston, Craig Kirkwood, Robert Conrad. Fan of The A-Team, 90210-esque soaps and Kevin Williamson? Then this fusion the two latter styles written by the creator of the former could be for you! So much so, in fact, that it may as well have been called Murder at Melrose. Yes, written by he who gave us Hannibal, B.A., Face and Murdoch and directed by nobody you’ll ever have heard of, things begin with the obligatory double slaughter of Corbin Bernsen and his missus. Then the film jumps forward five and a half months to Sweet Valley Bay City High – school for the offspring of LA’s most affluent families. Uber-goth student Jeff is violently appalled when his “communications” class laugh at his film project (a five minute gore pic) and is sent to the school shrink Dr Boone, who can’t get through to him. At a pool party soon after, Jeff punches a girl and flees in his car, pursued by said girl’s jock boyfriend, Dillon. Jeff eventually succeeds in driving over a cliff to his fiery death… Or so you’d think. On the first anniversary of his rather embarrassing demise, his equally bizarre friend Zara predicts his spirit will return from the Celtic Plain or whatever to seek vengeance on his tormentors. To nobody’s surprise but theirs, a cloaked and hooded, axe-toting nut begins doing away with Bay City High staff and students. Enter slick detective Sabato who suspects pretty much the entire cast but still finds time to romance Dr Boone. Meanwhile, Zara holds a seance, inviting a bunch of classmates to contact Jeff’s spirit and prevent any further murders, as each death seems to hold a clue as to who will be the next to go. Dead Above Ground shifts from character to character at such a rate, spending so little time on each that there’s nobody to root for (except the killer under certain circumstances). The sizable group of teens therefore serve only to annoy and virtually all of them walk away unscathed by the time the credits roll. In its favour, the director manages to cull good performances from most of the cast, although Josh Hammond goes for the thespian jugular as Looney Toon Jeff, but Charlie Weber impresses as the kid from the wrong side of the tracks and Sabato’s chief suspect. Like whatever though, Dead Above Ground is, like, totally dead in the water. Blurbs-of-interest: Bernsen had the titular role in both Dentist films; Hammond was one of the besieged school bus kids in Jeepers Creepers II and was also in 7eventy 5ive; Weber was a regular in Series 5 of Buffy the Vampire Slayer. Lauren German was the lead in Hostel: Part II. Chuck Bowman later directed The Tooth Fairy.